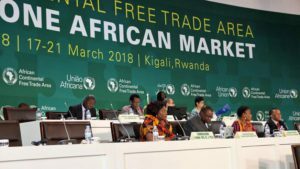 ADDIS ABABA – If Ethiopia’s impending ratification of Africa Continental Free Trade Area agreement (AfCFTA) comes to pass, the pact will be requiring only three other ratifications to enter into force. According to the African Union (AU), Ethiopia’s ratification will become the nineteenth out of the minimum number of 22 required to effectively bring AfCFTA into operation. The creation of AfCFTA is expected to be the largest trade zone in the world. Quoting the Prime Minister (PM)’s office, Africa News reports that Ethiopia approved the AfCFTA pact on Saturday. However, despite the cabinet’s approval, it will still be subjected to a legislative vote before instruments of ratification could be delivered to the AU. The AU had months earlier challenged countries from North Africa to ratify the AfCFTA, seeing that all ratifications, up to then, were from sub-Saharan Africa. While all the North African countries signed the Kigali Declaration enacting the AfCFTA, none of them have ratified the agreement. Countries that have already ratified include: Uganda, Kenya, Chad, Niger, Swaziland and Ghana. Others are Namibia, South Africa, Djibouti, Rwanda, Republic of Congo, Ivory Coast, Guinea, Mali, Mauritania, Senegal, Togo and Sierra Leone. AfCFTA aims to increase intra-African trade by 52 per cent by the year 2022, remove tariffs on 90 per cent of goods, liberalise services and tackle other barriers to intra-African trade, such as long delays at border posts.